Is the cocoa industry heading for the red? 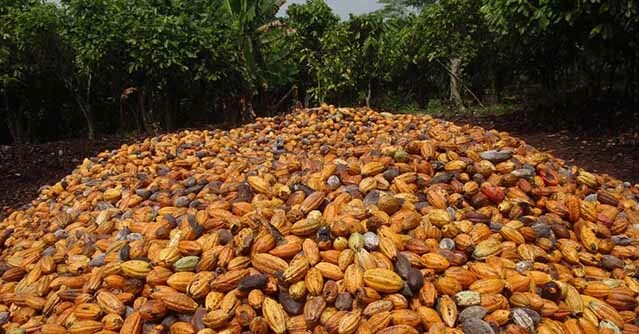 According to reports from the 6th annual Chocoa initiative held in Amsterdam last month, the general consensus from cocoa farmers, processors, traders and chocolate manufacturers is that the whole cocoa industry is struggling. “Today, less than 20% of the cocoa production is sustainable. The demand for sustainable chocolate is increasing while production in cocoa growing countries is decreasing”, said a Chocoa representative. There are many factors that contribute to the decline in cocoa production. Deforestation, climate changes, child labour, crop disease, social and political changes in the growing area and the income of farmers, all are collectively causing this decline. John Ament, Global Vice President of cocoa at Mars Wrigley Confectionery revealed “about 70% of Cocoa in the world is produced in West Africa by smallholder farmers who earn less that £1.50 a day.” This is extreme poverty and it can’t go on as many farmers can no longer afford to invest in their land, pay additional field hands, afford the correct fertilizers or apply new advanced practices that would help boost cocoa production. The cocoa bean is a precious resource that only grows in tropical areas with high rainfalls. The production is labour intensive, which means many farmers have to rely on family and their children to work the land, thus increasing the problem of child labour. Also with the crops being vulnerable to disease this is a major disadvantage as whole orchards could be wiped out. The Ivory Coast has already lost 300,000 hectares of diseased cocoa orchards due to cocoa swollen shoot virus in the past few years. Likewise, since 1946, the national eradication program has cut out more than 250 millions trees in Ghana due to contamination. Chairman of Cocoa Horizons Foundation Nicko Debenham suggests “we need to change the design of the farm to become multi-source incomes, a diverse farm.” The general feeling at Chocoa is that smallholder farmers need to broaden their production and be open to producing more products; they can no longer solely rely on cocoa, as it is not proving viable or profitable for them. This would open more opportunities for them and diversification is the way forward to help these poverty stricken communities. The confectionery industry relies so heavily on cocoa, the cocoa bean brings the flavour, a factor that cannot be substituted by anything; the cocoa flavour is unique. According to the Confectionery Production Magazine, figures show that the requirement for cocoa purely as a flavouring agent for chocolate is at 0.6m tonnes of the 4.7m tonnes currently produced. Cocoa beans are also used for their fat properties, however the melting behavior of its fat can be, and is already being, reproduced by the engineering of other more widely available fats. This is one aspect that can help the cocoa industry, as by using cocoa purely as a flavouring source and not for its fats too, this would reduce the demand for cocoa from its current level of 4.7m tonnes to 2.7m tonnes says the magazine. On the upside according to the European Cocoa Association the latest annual results show that 1.378 metric tonnes of cocoa was ground in 2017, which is up slightly from 1,343 metric tonnes being ground in 2016. Even though the Ivory Coast lost thousands of hectares of orchards due to disease in the past, it still produced a record harvest of 2.15 million tonnes for the 2016/2017 season. Here at Ragus we understand the importance of supporting the confectionery and chocolate industry as we supply pure sugars for ingredients to many of the major food and drinks companies that are involved with the cocoa industry. Ragus is the leading independent importer and manufacturer of pure sugar products, including crystalline sugars, syrups and treacles, occupying a unique position in the European sugar market, and indeed in history. We have been sourcing and manufacturing natural sugars for over 85 years and alongside our Ethical Trading Initiative (ETI) and Sedex accreditations, we undertake visits to our suppliers, including supplier brokers, mills and plantations, thus we understand the importance of supporting our sugarcane suppliers on every level.